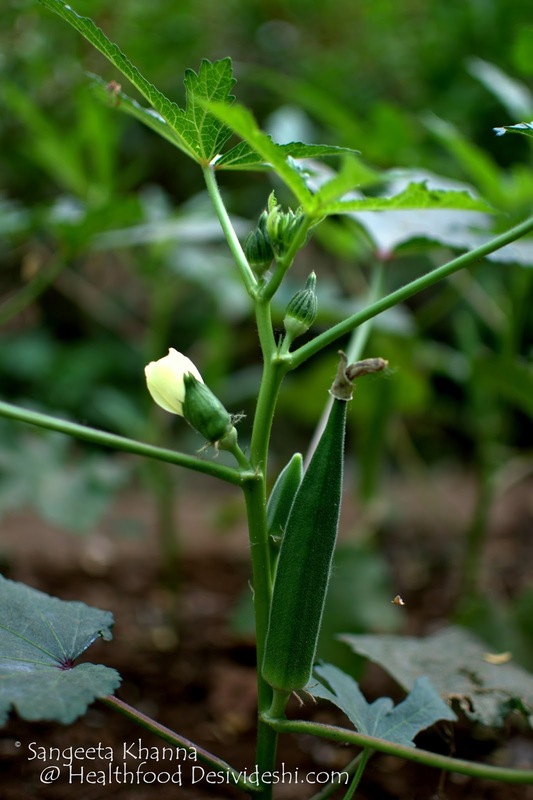 okra is a very good source of Vit.C, it is a low cal food with 20 calories per half cup sliced okra, it is also a good source of Vit.A, calcium and fiber, but the most interesting benefit of okra comes from the mucilage rich fiber it contains. The mucilage of okra soothes the inner lining of stomach and intestines, detoxifies the system and is very gentle on the system unlike bran which irritates the inner lining of stomach when consumed in large quantities. Okra should not be deep fried to retain all the health benefits, stir frying works best as the mucilage from inside the fruit is not decomposed and it gets absorbed into the powdered masalas (cornmeal or chickpea flour can also be used for this purpose) and we get optimal benefit of this vegetable. Arvind likes it stir fried while I can eat it even steamed. I make many versions of the stir fry, basically using different masalas or herbs to impart the okras a different flavor each time. 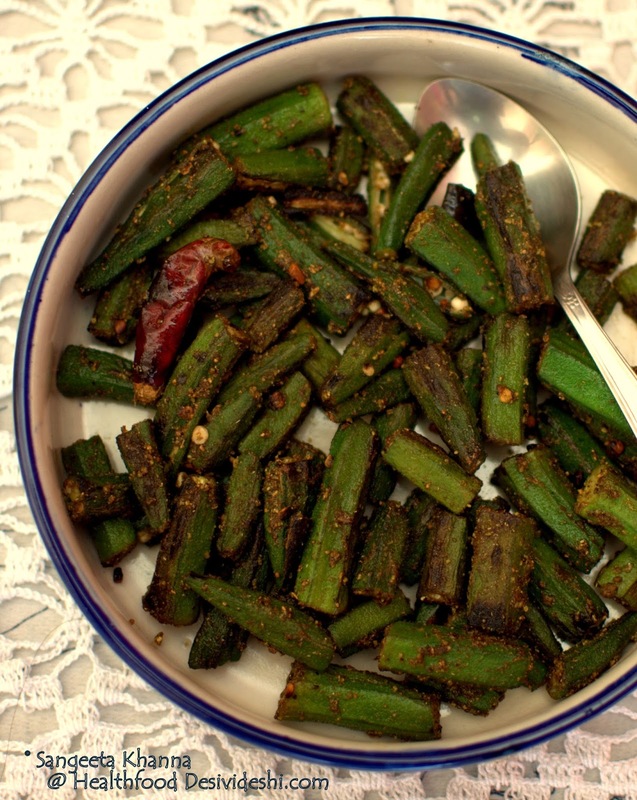 This ghee fried peppery okra is a family favourite. We eat this okra almost 4-5 times a week when it grows in the garden, sometimes I bake okra to make crispy kurkuri bhindi which is normally a deep fried recipe but I adapted it to be baked. Kashmiri masale wali sookhi bhindi is a very simple and quick preparation. The spice mix is not very authentic Kashmiri but somehow in our family it was know as Kashmiri as it is inspired by Kashmiri masala. 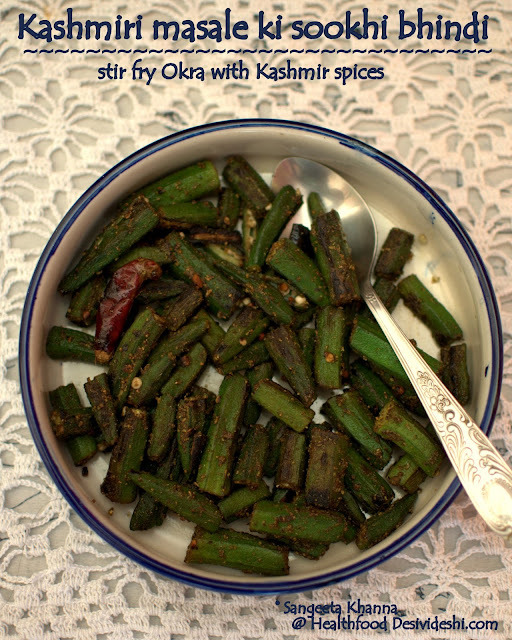 To prepare this Kashmiri masale ki sookhi bhindi, just wash and cut the okras (400 gm) in half, pat dry and keep aside. Heat mustard oil 1 tsp in a deep pan and throw in few whole red chillies and let them change colour. Now add the okras with salt to taste and stir fry on medium heat for 3-4 minutes. Add 2 tsp of powdered kashmiri masala*, fry till the okra takes a golden hue and it is ready to serve. It may take some 10 minutes to cook this way if using minimal oil like this recipe. The okra pieces should just be cooked and not browned, it is good this way to preserve the mucilage of okra too as I mentioned above. Dry roast all these spices and make a powder along with 8-10 whole red chillies, 1 tbsp dry ginger powder and 1 tbsp of amchoor (dry mango) powder and a pinch of asafoetida. Keep in a airtight container for later use. Just 2 tsp of this powder makes any stir fry hot, spicy and flavorful. I stock powders of all these spices so I mix the powders and use for convenience. You can do that too if you stock powders of all these spices. Kashmiri masalae ki sookhi bhindi is one stir fry that can make a meal for me if served with a little grilled chicken or even paneer. Love Okra, love your version. HOme grown should taste awesome. Kashmiri masala sounds delicious, so simple dish!! I LOVE bhindi's but J hates them. You should see how much natak he will do to escape eating them-suddenly he will feel unwell, suddenly he will lose his appetite, suddenly he will want to eat only curdrice, suddenly...too many ya!!! Now I don't care I just dump it on his plate and sit with him like HItler till he finishes it :P This one sounds interesting I will surely make it once. hey SJ....same here with karela.....suddenly things become sad when there is karela around....ha ha ......but i still make karela for myself. This is a nice way to make Bhindi!!! I love bhindi in any form or kind!!! Love they way you have made them!!! Love okra, this is a great preparation! excellent! okra looks perfect.. i am great fan of okra fry!!!.. looks yum.. this is my first visit to ur blog.. got good recipes.. If u have time pls checkout my blog!!! thanks sweta, ramya, 5 star foodie, viki and ashwini...most people like okra and i always make an okra preparation when entertaining guests as it is a safe option ......every household in India has a few okra recipes n it takes any flavor easily. tell me sangita, pl post pictures of your garden once and how do u manage to get space in a city like delhi. Hi Nirupama... we live in a government apartment and our's is a ground floor one . So even if the apartment is small we have a good space for a front and backyard garden . We have some perennial fruiting trees too but the vegetable garden is in a mess right now , i have not been able to tend the garden for months now ... but now i think i should get into it . Thanks for reminding me.